Torrefazione Gian Luca Venturelli roastery was created in 1996 and is one of the youngest Italian roasteries. Thanks to passion and resourcefulness of the owner the company quickly grew, widening their assortment. Current headquarter of the company is located in Carpenedolo, near Brescia. The roastery is now recognizable and appreciated in over 45 countries, and all thanks to the Lucaffe Brand! Particular attention was paid to create an attractive and functional packaging, while a range of well-designed accessories reinforces the image of the Italian brand. 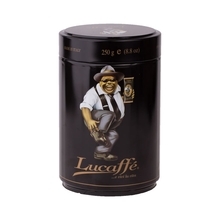 The little man from Lucaffe logo is visible on many coffee blends packages – a symbol of the quality of Lucaffe. 1 kg 250 g Ground Whole bean 100% Arabica 40/60 60/40 80/20 90/10 Sort by: Price (Low to High) Price (High to Low) Product name a - z Product name z - a Highest rate Lowest rate New in!